Kingsley Amis described Paul Johnson's Intellectuals as “a valuable and entertaining Rogues' Gallery of Adventures of the Mind.” Now the celebrated journalist and historian offers Creators, a companion volume of essays that examines a host of outstanding and prolific creative spirits. 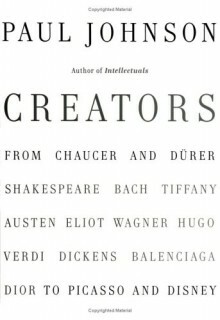 Here are Disney, Picasso, Bach, and Shakespeare; Austen, Twain, and T. S. Eliot; and Dürer, Hokusai, Pugin, and Viollet-le-Duc, among many others. Paul Johnson believes that creation cannot be satisfactorily analyzed, but it can be illustrated to bring out its salient characteristics. That is the purpose of this instructive and witty book.